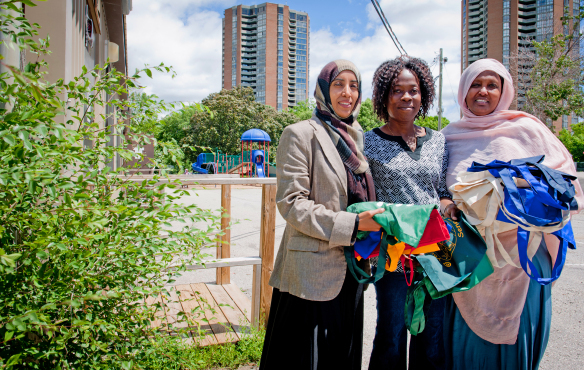 Haween Enterprises is a community-based sewing enterprise that provides sewing skills training, leadership skills and social support for immigrant women. We offer employment opportunities for program participants, who make Haween products as well as products for individuals and subcontractors. Our products include conference and event tote bags, book bags for public and private schools, grocery bags and t-shirts. Haween Enterprises offers quality work to small businesses who want to offer a “Made in Canada” product. Other Haween products include soccer and volleyball shorts, place mats, tea cozies, chair covers, aprons and pillows.